The Logitech K350 2.4 Ghz is a wireless keyboard designed for Windows-based systems. 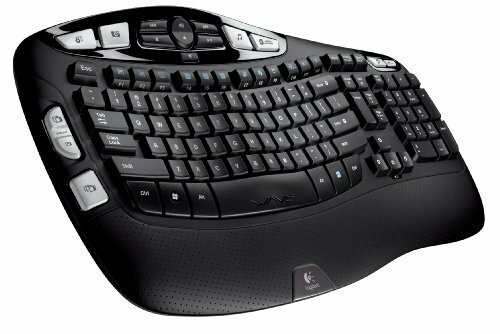 Its primary feature is a wave-shaped keyboard with keys of varying heights that accommodate the lengths of your fingers. This means that keys typically hit by the longer, middle fingers are shorter while the keys hit by the little fingers are higher. This design was intended to prevent stress and strain on the fingers while typing. This curve is easy to adjust to and only takes minutes to get comfortable with it, as opposed to Microsoft’s design. In addition, all the keys are the same size to facilitate typing and make a big difference in how quickly you can become comfortable with the layout of the keyboard. An included contoured and cushioned palm rest keeps your hands in position while typing and provides a place to rest your hands when you are not typing. There are also two separate adjustable feet that create an inclined effect to make the typing position more upright. The quality of the keyboard is very good, the material of the keyboard being a stiff plastic that is quie,t except when making keystrokes and also very comfortable. The material is soft and the curve feeling and ergonomics were found to be “perfect” and very suitable for many who spend all day on a keyboard. Another major feature of the Logitech K350 2.4 Ghz Wireless keyboard is derived from its name, an advanced 2.4 Ghz wireless capability that provides the reliability of a cord with the freedom and convenience that a cordless connection provides. One user found this feature to live up to its capabilities as advertised with the ability to be able to use the keyboard up to three feet away from the computer with no lag or lag connections issues. The keyboard was fast and easy to use. The Logitech K350 2.4 Ghz Wireless keyboard also offers a Unifying receiver which is a new technology that enables the connection of up to six compatible mice and keyboards to a single USB connection. Each set of mice and keyboard also has its own Unifying receiver so that it is possible to have them all plugged into several different computers all at the same time. Although this means that all your peripherals need to be from Logitech, their products are typically of high quality and the Unifying design enables the freeing up of USB ports previously used by other mice and keyboards. The Logitech K350 2.4 Ghz Wireless keyboard also features programmable keys which one user found afforded a great deal of flexibility in using the keyboard. Configuration is easy as all you need to do is select the key you want to program and then pick what you want it to do. Running applications and peripherals like audio from one touch of the keyboard has never been easier. An additional tab for the battery clearly shows how much battery power is left so you won’t be surprised someday by a powerless keyboard. Two AA batteries power the keyboard which Logitech claims can keep the keyboard going for up to three years with moderate use. The one drawback is that the keyboard is not compatible with the Mac but for the price, provides a great deal of functionality with comfort and ease of use.